Here’s how you make outstanding action figures: Take a pair of already beloved Amiibo statues, give them a ridiculous amount of articulation and load them up with accessories. That’s what Good Smile Company did to create the upcoming Squid Girl and Squid Girl DX Figma figures. 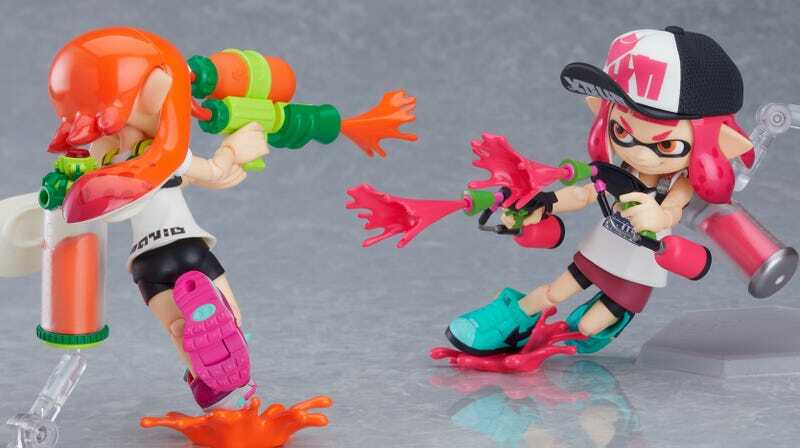 When I first saw images of GSC’s Splatoon Figma, now available for preorder with a release date of May 2019, I thought I was looking at actual Amiibo. Here’s the first Inkling Girl Amiibo, pictured below with a couple of friends. And here’s the second, as purchased by Kirk Hamilton. Pretty statues, right? Now here are the Figma. Same weapons, same clothes. The gear is different, but the gear is removable and swappable. You want the second Inkling Girl without the hat? Here ya go. Oh yeah, and she also comes with a couple of squids and some weapon options. How about that first Inkling Girl? Want her without all the extra stuff? Why not swap the face while you’re at it, like so? That is one of the freaking cutest things ever. But cute comes at a cost. The regular version runs about $50, which is par for the course for the Figma line. Splatoon Girl DX Version, on the other hand, is only available in a two pack with regular Splatoon Girl. Between the two figures and all the accessories, that pack runs around $115. It’s a lot, but you get a lot, both in terms of accessories and sheer cuteness. Check out the slideshow below for more shots of our Squid girls in action.